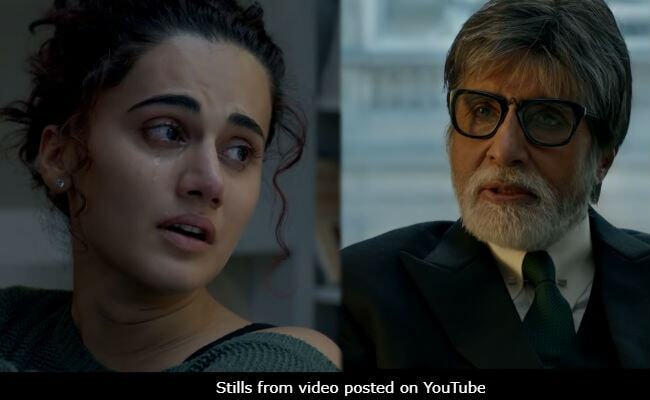 Badla, starring Amitabh Bachchan and Taapsee Pannu, appears to be an intriguing murder mystery going by the trailer, which hit the Internet on Tuesday. Director Sujoy Ghosh, writer and director of thrillers like the Kahaani series and Ahalya, is back in his comfort zone and that could be one of the best things about the film. Taapsee Pannu's character is accused of murdering her paramour. Lawyer Badal Gupta (Amitabh Bachchan), who is known for not having lost a single case in his 40-year-long career, appears to have come to her rescue. After listening to the story, Mr Gupta raises three question which stumps Taapsee, who can only say that she's being framed for the murder. Is she telling the truth? Badla is Amitabh Bachchan and Taapsee Pannu's second film together. They were earlier seen in National Award-winning film Pink, in which Mr Bachchan played Taapsee's lawyer. Meanwhile, Amitabh Bachchan also played the lead role in Sujoy Ghosh-produced Te3n, which was directed by Ribhu Dasgupta.